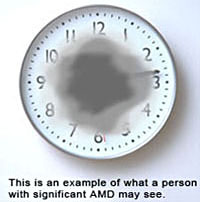 Age-related macular degeneration (AMD) is a disease that affects your central vision. It is a common cause of vision loss among people over the age of 60. Only the center of your vision is usually affected, therefore, people rarely go completely blind from the disease. However, AMD can sometimes make it difficult or impossible to read, drive, or perform other daily activities that require fine, central vision. In the USA, it is probably the most common cause of loss of vision. The macula is an area in the center of the retina, it has the highest concentration of light-sensitive tissue. As you read, light is focused onto your macula. Because of the macula you are able to read, drive, and perform other activities that require fine, sharp, straight-ahead vision. Dry AMD is the most common form. Slowly, the light sensitive cells in the macula break down. With less of the macula working, you may start to lose central vision as the years go by. It can progress to the more damaging Wet AMD type. Wet AMD is less common, but causes more severe vision loss. It occurs when scar tissue starts to grow around the macula. It is the worst type of AMD to have and all of our treatments try to prevent it from developing. The risk for AMD increases as a person gets older. People in their 50's have a 2% chance of getting AMD. This risk rises to nearly 30% for those over age 75. Besides age, other AMD risk factors include: women, smoking, family history, high cholesterol, and high blood pressure. The most common symptom of dry AMD is slightly blurred vision. You may need more light for reading and other tasks. As dry AMD gets worse, you may see a blurred spot in the center of your vision. Over time, the blurred spot may get bigger and darker, taking more of your central vision. Loss of central vision occurs slowly in dry AMD. In contrast, early symptoms of wet AMD are sudden onset of blurred vision or straight lines appearing wavy. Current treatment of dry AMD is to stop its progression. A major clinical trial by the National Eye Institute has shown that using antioxidants and zinc vitamins cause a 25% reduction in the progression of AMD. 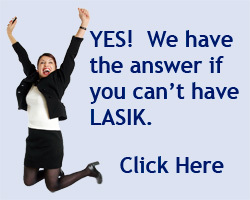 Some cases of wet AMD can be treated with laser surgery. The treatment involves using a laser to stop further scar tissue from growing. If you are beginning to experience any symptoms of wet AMD you need to be seen immediately.